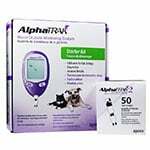 AlphaTRAK 2 Pet Blood Glucose Test Strips 100/box is accurate, easy to use, requires a tiny blood sample, provides results in seconds, and is made specifically for dogs and cats. Product is for 100 AlphaTRAK 2 Test Strips by Zoetis. 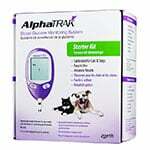 ADW Diabetes offers free standard shipping on all AlphaTRAK products. AlphaTRAK 2 Test Strips work with both AlphaTRAK and AlphaTRAK 2 Meters. AlphaTRAK 2 Test Strip requires only 0.3 uL of blood. Angled sample area makes it easy to position the target area on your pet to the blood drop. Sample tab is designed to break the meniscus of the blood sample to allow for fast wicking. Automatically turns the meter on and off for quicker testing. The test only starts when the strip has enough blood. More blood could be added to the same side of the AlphaTRAK 2 test strip for up to 60 seconds. I think the strips are great for my cat and the monitor. Fast service but they are expensive. Both me and my cat are senior citizens and would like if the prices were lower. Fea does not have Medicare or MediCal. It is all out of pocket. The product is good though and has helped us monitor our cat's blood. Life saver! I searched for ADW after being fleeced by Our Vet on the cost of the strips. Great Service AND shipping. I will deal with ADW before ANY other from now on! Affordable and trustworthy service. Always arrives on time when I am out of supples and autoship has help making it easier. Have been with them for over a year now. I really like ordering from ADW because they always have what I need and the delivery is very quick. Been using these strips for nearly two years with no issues. Prompt delivery and a good price. We have used this item for our cat and he is doing great. I hate pricking his ear but need to know he is doing good. It would be nice if they were a little cheaper. 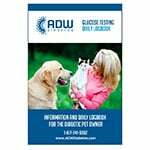 I get all my cat's diabetic supplies from ADW. I especially appreciate how quickly they arrive.